Connecting people, plants and place. Ben Tyler is a wonderful bininji man from murdudjurl country, who grew up on his homeland that is now Kakadu. After some years living in Darwin and beyond, Tyler is back on country and has co-founded Kakadu Kitchen, a business that promotes Indigenous food with a modern twist. Tyler’s first memories of food are collecting bush tucker and eating fruit from trees grown on his farm. One of these trees was a starfruit tree that was gifted to his family from a Greek family in Darwin. 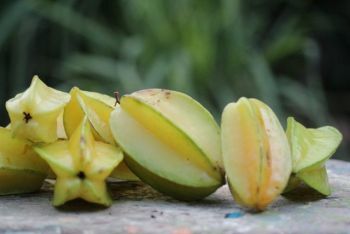 Starfruit (Averrhoa carambola) is a wonderful tree, also know as Caram-bola. It’s a really pretty medium tree with weeping branches and beautiful pink flowers, which grows well in the Darwin region. Its origins are thought to be from Indonesia and the fruit has five ridges which, when cut into slices, make a star shape. The fruit is sweet and crisp, juicy with a hint vitamin C and antioxidants. This fruit makes a wonderful addition for taste and aesthetic to many sweet and savoury salads and is also fantastic as a garnish for deserts and savoury dishes alike. For Tyler, the starfruit tree represents his connection to Darwin and last year Tyler created a Greek inspired starfruit salad for the GULP story telling event Eat my Words, to tell this story of friendship and connections, as well as a story of connection to country. The inspired fruit salad in-cludes symbolism of Indigenous stories, sitting under the stars (starfruit) by the campfire (red capsicum). 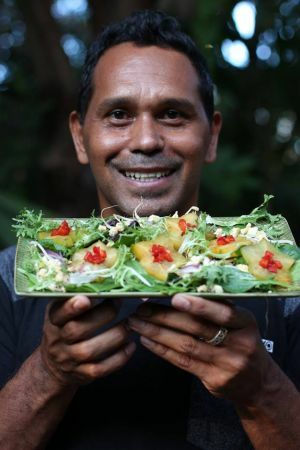 You can check out Kakadu Kitchen at A Taste of Kakadu in May and his recipe will appear in a new cookbook featuring community cooks – soon to be released. If you’d like to be involved in community cook please don’t hesitate to get in touch in touch with Emma Lupin. 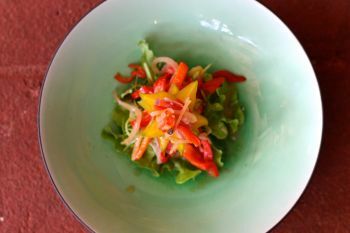 Thinly cut the starfruit (removing any brown edges), cucumber, capsicum and red onion. Crumble or cut feta into small cubes. Set aside. Cut the lemon and squeeze the juice into a jug or container. Measure the cider vinegar, olive oil and honey and mix with the lemon juice. Finely dice the chillies and garlic and add to the dressing. Season to taste and tear the mint leave for a garnish. In a serving bowl or platter lay the starfruit over the mixed local greens, place the capsicum in the sliced starfruit, or distribute evenly over the platter, then add the cucumber, onion and feta. Pour over the dressing and garnish with the mint. 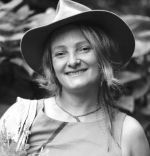 Emma Lupin is a tropical plant specialist and local food enthusiast with a passion for sustainable living and community connection. She is an environmental educator and artist and encourages connection to the beautiful natural world, particularly our tropical home.